The Mile High City is an amazing destination for kids. In addition to the world-class Denver Zoo and Denver Museum of Nature & Science, there are all kinds of attractions to stimulate and excite young minds, and great ways to release all that energy kids have. This two-day itinerary is jam packed with family fun for an experience you or the kids won’t soon forget. Denver may be a landlocked state but there&apos;s plenty of marine life to see at the Downtown Aquarium. More than one million gallons of fresh and seawater exhibits offer a fascinating view of marine ecosystems from around the planet. Take a self-guided tour and set your own pace as you view more than 500 species of animals including sharks, eel, grouper, rainbow fish, trout and more. Young children love the brightly colored fish while older kids love the desert thunderstorm exhibit that simulates a flash flood, and the tiger exhibit with big cats splashing and playing in the water. And everyone will love the interactive Sting Ray touch tank. Just one look at the colorful, interestingly shaped building and you know the kids will have a good time. The Children&apos;s Museum of Denver has 11 interactive Playscapes where children can shoot baskets, climb on an authentic fire engine, build toy railroads and go shopping in a mini-supermarket. This hands-on learning experience is an ideal destination for children ages 3 to 8 years old. You should also know that the first Tuesday of each month is free from 4pm to 8pm. Having climbed aboard a real fire engine, now would be the perfect time to take the kids to the next attraction. The best things in life are free, including admission to the Denver U.S. Mint. More than five billion coins are made here each year and it&apos;s also the second largest storing facility of gold bullion in the U.S., behind only Fort Knox. Being home to so much money, you can imagine security is extremely tight. You won&apos;t be allowed to carry in purses, cameras, pens, lipstick, strollers, diaper bags, or cell phones. Now that the kids know money does not in fact grow on trees but is made in a highly secure government building, you should take them to another government building. Head to the Capitol Hill neighborhood for the next destination. You&apos;ll find a number of places to eat on and around the 16th Street Pedestrian Mall. The Denver Pavilions (500 16th St.) on the south end of the mall offers a number of familiar restaurants while the pedestrian mall itself is lined with outdoor cafes and unique dining establishments. Whether you&apos;re in the mood for a burger, fine dining or simply want to grab a salad, the area is packed with family friendly establishments. While you walk around the area you&apos;ll be entertained by street performers and can get in some shopping as well. You&apos;ve covered enough ground for one day - call it a night! Start day two of your family weekend in Denver by heading toward Confluence Park. Renovated in 2002, this is one of the most frequented downtown parks and home to the South Platte River&apos;s premiere kayak chutes. The kids will experience quite a rush watching adventure seekers brave the rushing waters. If there aren&apos;t any kayakers, don&apos;t worry; it&apos;s still worth the trip for the great views of downtown and an extensive walking and biking trail. A quick trip here is a great way to start the day. After watching the action that takes place on water, now take in some action that takes place on land and head to your next destination. 20TH & LITTLE RAVEN STS. Ollies, grinders and rail slides are just a few of the moves you and the kids can take in at the 50,000-square-foot Denver Skate Park. Always packed with skaters, you&apos;ll see novices and experts alike attack the urban environment of planters, curbs, rails, bowls, half-pipes and more. Now that you&apos;ve kicked off the morning with a couple adventure sports, it&apos;s time to head to Westminster for your next stop. This 30,000-square-foot facility was the first stand-alone non-profit insect zoo in the nation. At the Butterfly Pavilion, you&apos;ll see more than 1,200 free-flying butterflies imported form around the globe from as far away as Kenya and Malaysia. Be sure to wear white or bright colors, as they tend to attract the butterflies. Now that you&apos;ve seen little creatures that flutter about, now take the kids to where giant creatures roamed the earth in pre-historic times. Drive southwest from Westminster to Morrison Colorado for your next stop of the day. Kids love dinosaurs -- it&apos;s a fact! Dinosaur Ridge is a spot where millions of years ago huge reptiles roamed the earth and where today you and the kids will find Jurassic dinosaur bones, such as Allosaurus, Apatosaurus and Stegosaurus. Take a free, self-guided tour that includes 16 interpretive signs that describe the fossil remains and other relevant features of the area. The Visitor Center is a great place to start as you can ask questions before you embark on your prehistoric journey. While you&apos;re in the area, now is the perfect time to head down the road to your next stop. Aside from being a geological wonder 70 million years in the making, Red Rocks Park & Amphitheatre is one of the world&apos;s most famous concert sites and a must see for any music enthusiast. Well-known symphonies, and bands such as The Beatles to U2 have graced the stage surrounded by dramatic 500-foot high red sandstone cliffs. Kids love exploring the trails surrounding the concert venue, and a spectacular view of the plains make it a perfect place for a kid-friendly hike. There are also dinosaur tracks and fossil fragments dating back 160 million years to captivate amateur geologists and kids alike. By now, it&apos;s getting pretty close to dinner and a good time to start heading back toward Denver. Drive to Lakewood for an early dinner and your last stop of the day. Casa Bonita is a must-do for families. Spend an evening at this huge Mexican themed restaurant featuring strolling mariachis, flame jugglers and a 30-foot waterfall complete with cliff divers. This popular family dining destination also has a small puppet theater, a "haunted tunnel" called Black Bart&apos;s Cave, an arcade with a large skee-ball room and a magic theater. South Park fans may know Casa Bonita from the classic episode of the same name, where the gang pays a madcap visit to the restaurant. The Mile High City is an amazing destination for kids. There’s a lot to do in Denver, but three days gives you plenty of time to take in much of what the city has to offer without feeling like you’ve rushed through the sights. Denver's art world is booming, and thanks to the city's walkability, visitors can experience some of the best artsy attractions on foot in a single day for less than $50. Denver has the most vibrant LGBT scene in the Rockies, with citywide annual events and a busy club scene. More than half a century after the publication of Jack Kerouac's era-defining novel, On The Road , was published, the taboo-shattering exploits of the Beat Generation remain as cool as ever. With 300 days of sunshine and a skyline framed by the spectacular Rocky Mountains, it's no wonder that Denver has attracted a wide array of talented photographers over the years. If you love dinosaurs, Denver is the place to be. Lower Downtown Denver (LoDo) is hot. You don’t have to break the bank to have a great time in Denver. These free tours take you behind the scenes at several unique Denver attractions. From spas to shopping, from dining to dancing, Denver has everything you need for an unforgettable girlfriend getaway weekend. Get a mile high (and much higher) in The Mile High City. Spend a day in the Highlands, one of Denver’s great neighborhoods, just a few minutes northwest of downtown. This walking tour will take you to some of the best spots in downtown Denver, where the city’s past and present come together in utterly unique ways. 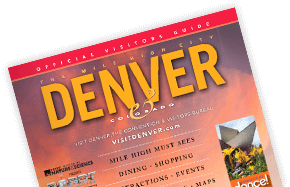 These guided tours offer VIP access to some of The Mile High City’s greatest hidden gems. All over the city, you’ll find gorgeous murals, whimsical sculptures and other kinds of public art that will delight and inspire. Looking to rock out in The Mile High City? Here's a look at some of your options. Air guitar is encouraged. Whether you're on your first date or your 50th, here are some of our favorite starry-eyed spots.